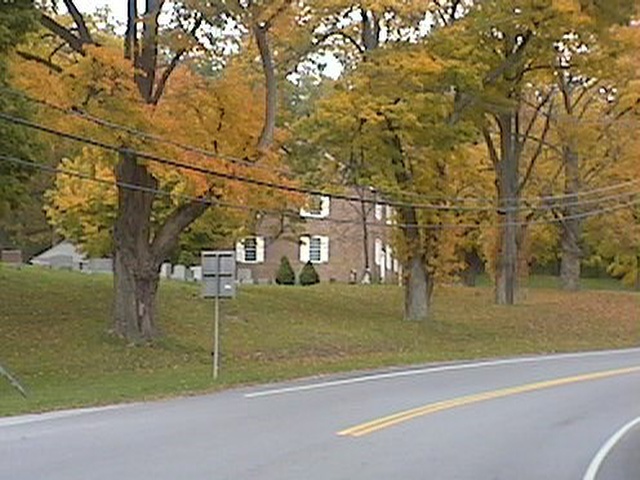 The Town of Washington is in the north and center of Dutchess county. It has a reputation of being a weekend area of large estates and horse farms for New York City residents. Like Standford to the north, it is very rural and has gentle rolling farmland and woodlots. There are several large parcels set aside for preservation, eg. Innisfree Garden, Carey Arboretum and the Millbrook School. The village of Millbrook is in the center of the town. Mabbettsville, Hart's Village and Lithgow are historic hamlets surrounding Millbrook. 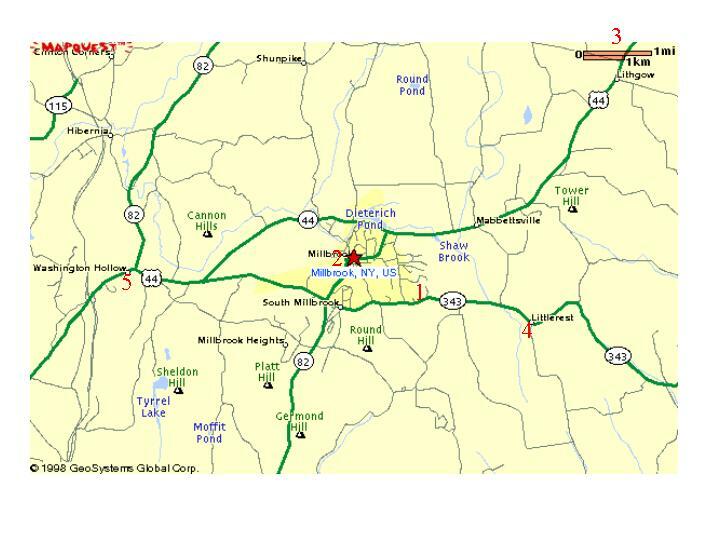 NY Rt 44 bisects the town and runs east and west, connecting Pleasant Valley - Millbrook - Amenia. Rt 343 is an extension of Rt 44 at Millbrook that travels onto Dover. Facts and Figures from JW Poucher's "Old Gravestones of Dutchess County", 1924. See Dutchess County Cemetery Internments for Poucher's exact comments. (Washington PO) 1807 1812 319 Active cemetery on Rt 343 and Church Street on the southern edge of the Village. Operated thru the Lyall Federated Church, Millbrook, 845-677-3485. Area originally known as Mechanic. "This locality was settled by members of the Society of Friends 1725-1750. Until 1744 the settlers were affiliated with Purchase Monthly Meeting in Westchester County, and from 1744 to1769, with Oblong Monthly Meeting at Pawling, Dutchess County. Nine Partners Monthly Meeting was established in 1769 and a log meeting house was erected. The log house was succeeded in 1780 by the present brick building. The yard surrounding the same has been in continuous use as a burial ground." 1867 Beers map shows a now non-existing Hixite Church building just west of the existing Orthodox Church. 3 St. Peter's Epicopal Lithgow 1811 1812 221 Active cemetery on CR 57, 100 yards and visible from Rt 44 845-677-9286. St. Peter's was at this location from 1834 - 1880. Church shown at this site in 1867 Beers. 3 Northrup Ground Lithgow 1787 1796 76 Immediately Northwest and adjacent to the current location of St. Peter's Church. It is weeded, but not too overgrown. The stones are very obvious.. In 1914, "Overgrown and deserted." 4 Davis Ground Little Rest 1805 1807 7 On Chestnut ridge road, on the west side of the street, by the road. Overgrown. In 1915, "Overgrown and deserted. " Shown on 1867 Beers Atlas. Washington Hollow Washington Hollow Actually in the Town of Pleasant Valley. Very old and still active cemetery in Pleasant Valley, but on border with Washington, and associated with the Millbrook area. On Rt44 and at the intersection with Rt 82 heading north. There is an old church across the street dated 1850's and currently run as an antique shop, but I do not know if this is the former Presbyterian church. Haight Ground Oak Summit 1846 1848 17 Not visited. In 1914, "At oak summit, on the Chesbro’ Farm. Overgrown and deserted." TerraServer, From map, appears to be off the east side of Killearn Rd, ~0.75 mi south of Rt 343. White Ground Mabbettsville 1806 1812 15 Not yet found. In 1915, "A half mile east of Mabbettsville, on the farm of John Murphy. Overgrown and deserted. Dutch Reformed Washington PO Church Per 1867 Beers, Non-existing building. South side of Rt 343, about 40 rods west of the current monument at Old 82 and Rt 343.